As you know, I love a well polished look, I love having a collar done all the way up, pressed and perfect but what if you want to still wear a necklace with your shirt? Make it your own look? More and more retailers are listening and making necklaces that are shorter, perfect for wearing with your collared shirts. 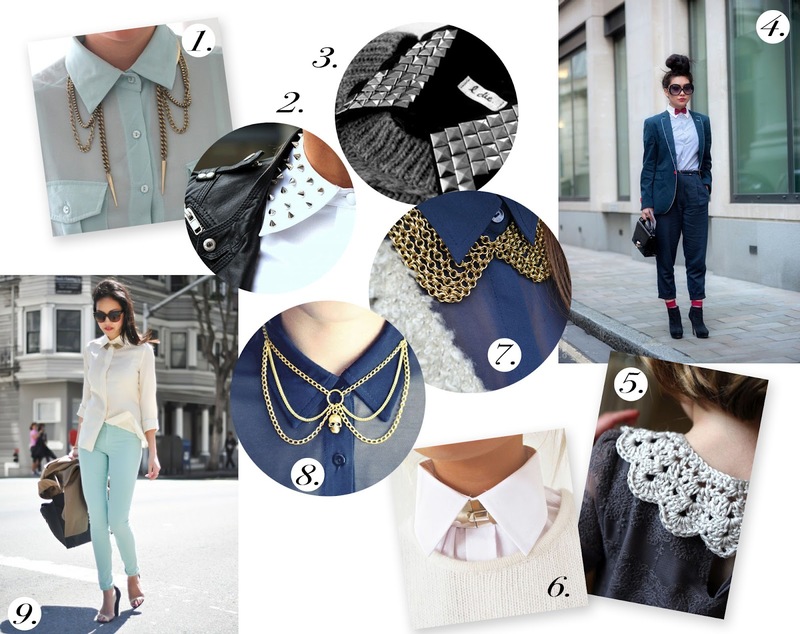 A few DIY inspiration images here too, the studded collars (2 & 3) I particularly like, the crochet collar (5) also leads to a tutorial for a softer style look. I have got to find that chain necklace (7) and the skull one (8), love those! The only thing to remember with this look is to keep the rest of your jewellery simple, combine with simple studs. Always press your shirts, especially the collar and buttons, shirts can be worn tucked in (4) or loose (9) depending on how casual you want to make it. If you don’t fancy a necklace, why not a bow tie? If you fancy, see my previous post on Peter Pan collars. 1. Symmetrical collar necklace 2. Studded collar 3. Pyramid studded collar (I’ve got to give this a go!) 4. Great look with a bowtie and super boots 5. Crochet collar (links to a tutorial) 6. Choker style necklace 7. Chain-mail necklace 8. Skull necklace 9. Crisp cream shirt with mint jeans, smart.